Honey has been used by countless cultures all around the world over the past 2,500 years. It is known as Honig in German, Miele in Italian, Shahad in Hindi, Miel in French and Spanish, Mel in Portuguese, Honing in Dutch. The term raw honey refers to honey that has not been processed, filtered, or pasteurized like most of the honey sold in stores. Many people believe that raw honey benefits us a lot because many of the nutrients in it are well preseved. Honeybees get these nutrients directly from plants, including a substance called propolis which might act as a natural antibiotic. When speaking of ray honey benefits, treating allergy always comes first. Eating small amounts of raw local honey a day could helpbuild up your body immunity to allergies such as hay fever and pollen. The theory is that the plant materials in the honey can act as a sort of vaccine that strengthens the immune system. To be effective, the honey must come from a local beehive. Antioxidants and phytonutrients are the active ingredients in propolis or honey glue. These substances can counteract the damaging effects of oxidation in our body, boost your immune systems and delay the process of aging. Honey has been proven to be a potent natural cough suppressant. A 2007 study at Penn State University’s College of Medicine found that a small dose of buckwheat honey was more effective than many over the counter children’s cough medicines. 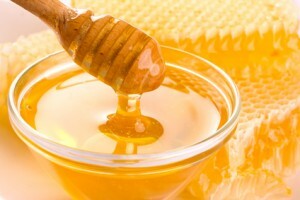 Honey is particularly effective in suppressing coughs at night. Raw honey contains two substances that the body converts directly into energy fructose and glucose. Glucose or sugar is a source of instant energy, while fructose is a long-term energy source. Some athletes also use raw honey as an “energy drink” in training. Raw honey is also a good source of vitamins, such as vitamin B.
Honey has been used to heal wound for centuries. Modern researchers have discovered that honey is a highly effective antibiotic and antiseptic that can ease infection caused by bacteria, fungi and so on. Honey may also have the ability to reduce inflammation and irritation. Simply rub a thick layer of honey over cuts, burns, and scrapes to speed up the healing process. Since honey is a natural antibiotic, it can treat many kinds of infections including the bacteria that cause acne. Massaging honey into your face every morning can moisten your skin and get rid of many rashes and other problems. Honey is also useful for healing blemishes and some other discolorations. In its natural, raw state, honey contains many enzymes that can help some people digest food more easily and it may also help treat ulcers and diarrhea by killing the bacteria that cause those problems. If constipation is the problem, you can make a warm tea by mixing a spoonful of raw honey, a couple spoons of raw apple cider vinegar with warm water to get relief. This raw honey benefits will be welcomed by girls. The depletion of some enzymes in the body can speed up the aging process. Raw honey can slow the effects of aging by limiting the depletions of them because it contains an enzyme called amylase. This amylase speeds up the breakdown of sugars and carbohydrates that restore the damaged skin to a healthy look. The U.S. Centers for Disease Control and Prevention (CDC) and The American Academy of Pediatrics warn against giving raw honey to infants under a year old because it might contain Clostridium botulinum spores and toxins that could cause infant botulism.